When Grilla Grills, then Fahrenheit Technologies introduced the Grill Pellet Grill, they didn’t follow in anyone else’s footsteps. That pellet grill was and still is a unique pellet grill that is very efficient, but has a limited capacity. Riding on that success, the Grilla Grills people then introduced the Silverbac (get the gorilla reference?). This is a much more traditional, barrel style pellet grill. This review is based on the new, 2018 model of the Silverbac, though there are only a few changes. 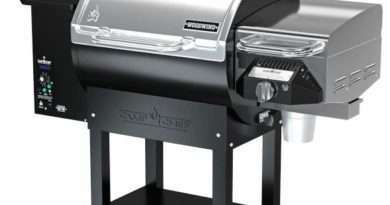 When looking at pellet grills below $1,000USD, there doesn’t seem to be a lot of variety. The Silverbac looks a lot like other model. It is, however, built with a little more weight. In fact, it is considerably heavier than the comparable pellet grill from Traeger. This weight it in the lid (because you couldn’t build a lighter weight lid than Traeger) and the rest of the body. The Silverbac can hold heat inside better and while it’s operating temperature range isn’t much different than the competition, holding in the heat means it uses less pellets and pellets are a big cost in operating a pellet grill. The temperature controller on this model is simple, but accurate. My read on the internal cooking temperature doesn’t fall far off of the controllers reading. The controller has a single meat probe, but is not WiFi enabled so you do have to watch the grill to hit the temperature you are looking for. This isn’t a downfall in this price range, but just something worth mentioning. The controller is, however, intuitive and easy to use. In this price range, and given the capacity, this is the pellet grill to buy. It is well packaged (which is important since you will probably have to order it online) and the instructions are well written. Grilla provides a number of accessories for this grill and have a good reputation for supporting their products. I do suggest, if you are looking for a smaller pellet grill with a very small footprint to consider the original Grilla Pellet Grill.